There’s nothing about defunct attractions, shows, restaurants, or shops at the Disneyland Resort or Walt Disney World in today’s Yesterland article. Instead, this article is built around a collection of eight recent photos sent to me by a Yesterland reader. 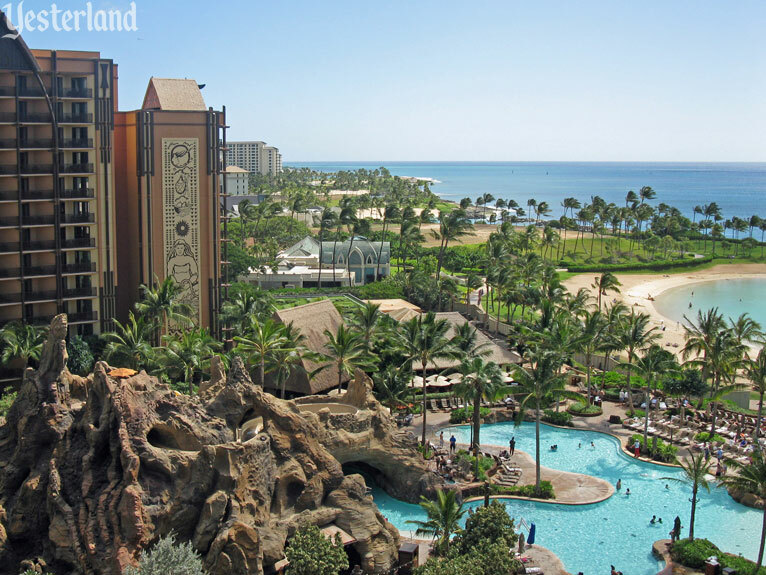 They were all taken from a lanai (balcony) on the Waianae tower at Aulani, a Disney Resort & Spa at Ko Olina, Hawai‘i. I really liked the photos, and I hope you will too. Imagine that you’re on your private lanai about halfway up the Waianae tower at Aulani. No matter which direction you look, the view is great—but the best view is toward the ocean. Trade winds keep you comfortable. You hear the sound of happy children below, but they’re not close enough to be annoying. Maybe you’re munching on macadamia nuts and sipping a tall POG (a popular drink blend of passion fruit, orange, and guava juices)—or perhaps something stronger. What was once a flat, defunct sugar cane field has been Imagineered into the Waikolohe (mischievous waters) Valley, surrounded by the U-shaped resort. In Hawai‘i, an ocean-view room is always better than a so-called “island view” room—which in Waikiki can mean a view of a building across the street. But this is Ko Olina, not Waikiki, and an island view here can actually be rather pleasant. On the photo above, look beyond the lobby building for a sample of the view. I’ve followed the progress of Aulani since October 3, 2007—before it even had a name. That’s when Disney first announced plans to build an 800-unit resort on a prime 21-acre oceanfront site on O‘ahu in the state of Hawai‘i. I was able to see the construction firsthand in July 2009 and January 2011. 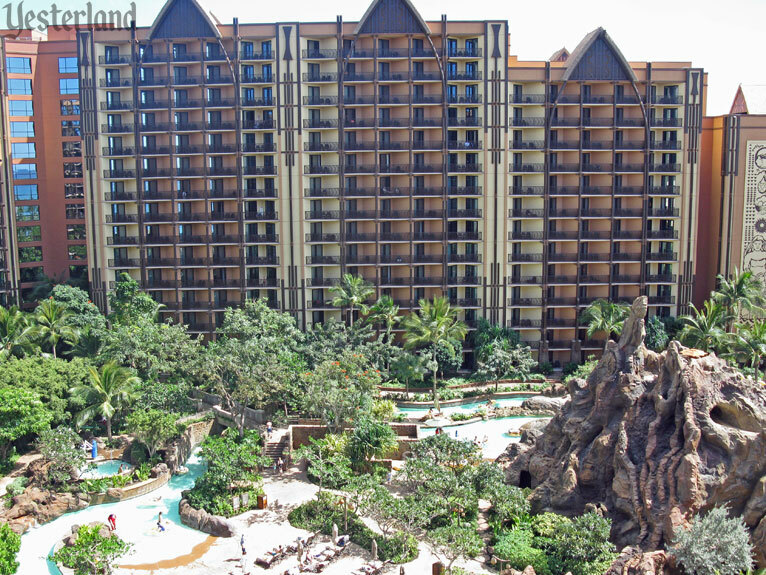 Aulani opened on schedule on August 29, 2011. Although I published photos of Aulani open for business, I have not yet had the pleasure of seeing the completed resort for myself. That will change this year. I’ll not only get to see it, but my wife and I will stay there in an ocean-view Disney Vacation Club (DVC) villa. 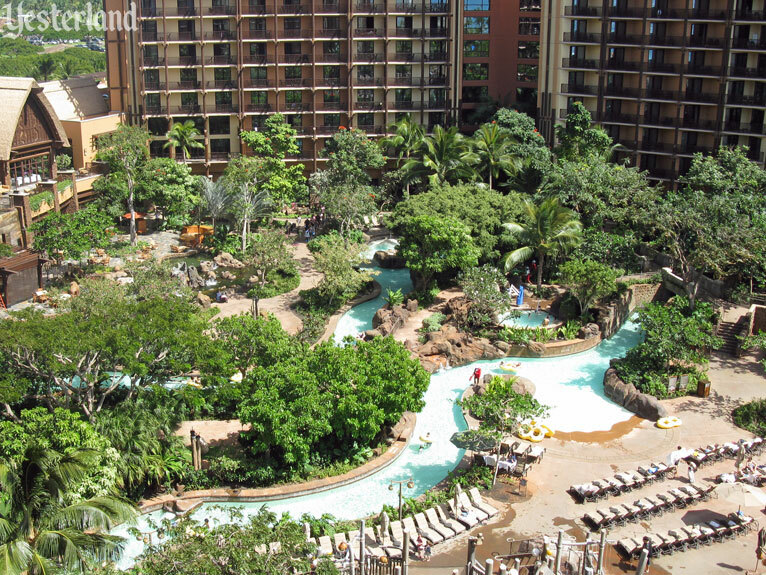 The Imagineers managed to put a 900-foot-long lazy river into the Waikolohe Valley. Although not as long as Cross Country Creek, the 3,000-foot-long lazy river at Disney’s Blizzard Beach, it’s very impressive for a resort hotel. Disney is known for great rockwork. Think of Cars Land at Disney California Adventure. The rockwork at Aulani was designed to look as if it had been there long before the resort towers were added. On O‘ahu, remnants of ancient volcanic activity are eroded and brown—not at all like the recent black lava flows of the Big Island of Hawai‘i. The star of the rockwork is Pu‘u Kilo. From the top of this small Disney mountain, guests have two choices. They can plummet in darkness down Volcanic Vertical, an enclosed body slide, into the Waikolohe Pool. Or they can carry a single or double tube to the top for a journey down Tubestone Curl into the Waikolohe Stream lazy river and eventually into the Waikolohe Pool—where they arrive much later than those who chose Volcanic Vertical. Menehune Bridge is named after the “little people’ of Hawaiian legend, builders who could create masterfully crafted works overnight. Here, they created a water play area for young children. 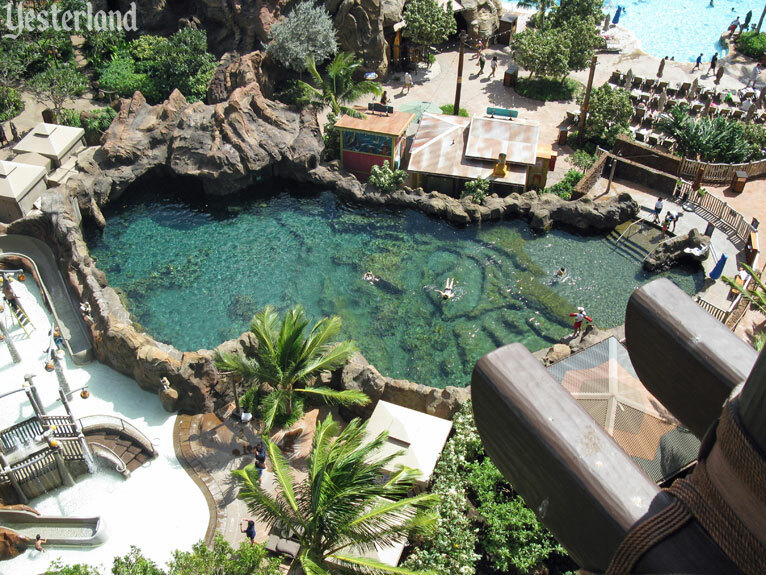 Aulani has its own private saltwater snorkeling lagoon. For a one-day rental fee of $20 per adult or $15 per child (rate in 2013), guests can swim among colorful local fish and various underwater surprises of Rainbow Reef. 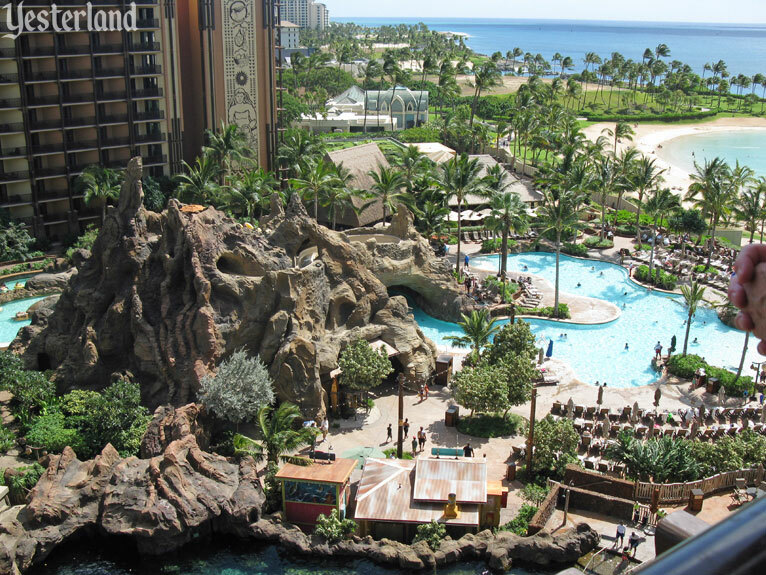 For slightly less than twice that price, Aulani offers a length-of-stay rental. Looking down from the lanai, Rainbow Reef adds to the variety of attractive water features of the Waikolohe Valley. Waikolohe Pool and Ko Olina Lagoon 1. The jewel of the Waikolohe Valley is the Waikolohe Pool, an 8,200-square-foot, zero-entry pool on the lagoon side of Pu‘u Kilo. 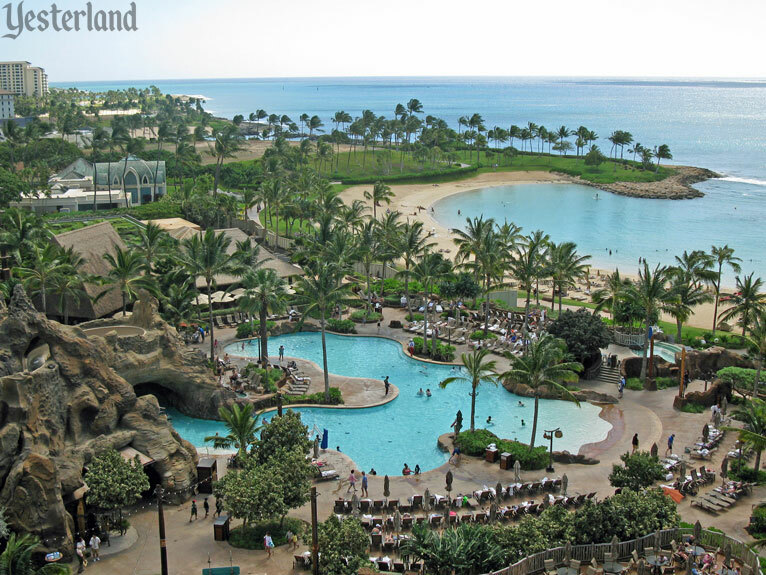 Aulani faces the public beach that surrounds Ko Olina Lagoon 1, the largest of the four manmade lagoons at the Ko Olina Resort. Speaking from experience, these lagoons are wonderful. The water is warm and waves are minimal. It’s a perfect family beach for swimming. But as with any body of water, there is risk. There have been several drownings and near-drownings at the lagoons of Ko Olina. Lagoon 1 is the best lagoon for snorkeling. As part of the effort to lure prospective timeshare buyers to the nearby Marriott’s Ko Olina Beach Club, Marriott people have offered morning fish feedings at Lagoon 1 for many years. The local fish show up for the feedings and many hang around afterwards. Aulani seems so perfect. Who could possibly find fault with anything at Aulani? The Walt Disney Company. That’s who. 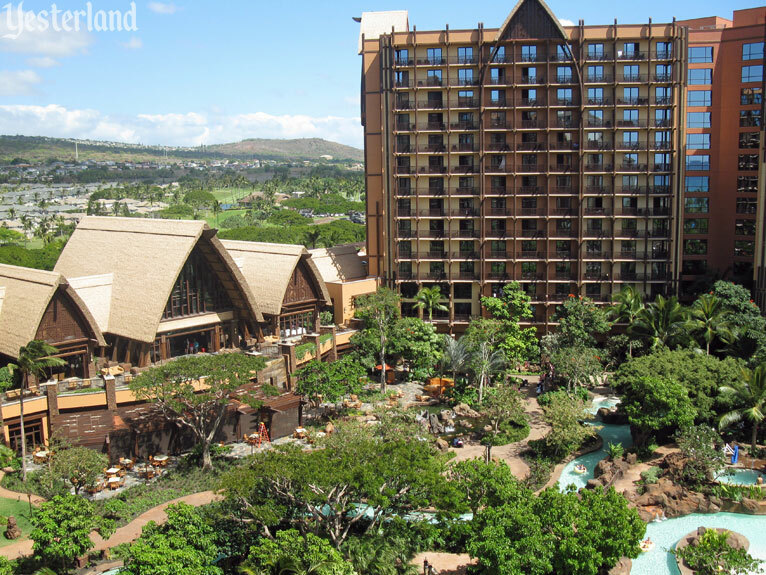 Despite all the planning that went into Aulani—or perhaps because of it—Disney found itself with a resort that guests didn’t want to leave. Most guests at other Disney resorts spend the day at theme parks. Many guests at other O‘ahu resorts spend the day at some of the many recreational, natural, historical, shopping, and cultural attractions of the island. But guests at Aulani primarily wanted to enjoy Aulani. The DVC component had not yet opened its final phase, but there would not be enough capacity at the resort’s pools and lunch spots once it did. Disney would have to take its spectacular resort and make it even more spectacular. Disney is now working toward a September 2013 completion of a year-long enhancement project. Aulani is gaining two new food services options—an ocean-view, outdoor patio serving breakfast, lunch and dinner, and Little ‘Opihi’s, beachside, grab-and-go location which has already opened. The popular Starlit Hui nighttime show has moved to a larger venue. At its old location and where the now-closed Makai Preserve sting ray swim had been, a themed family pool with a misty grotto is taking shape. The project will bring new deck areas with more chairs and chaises. 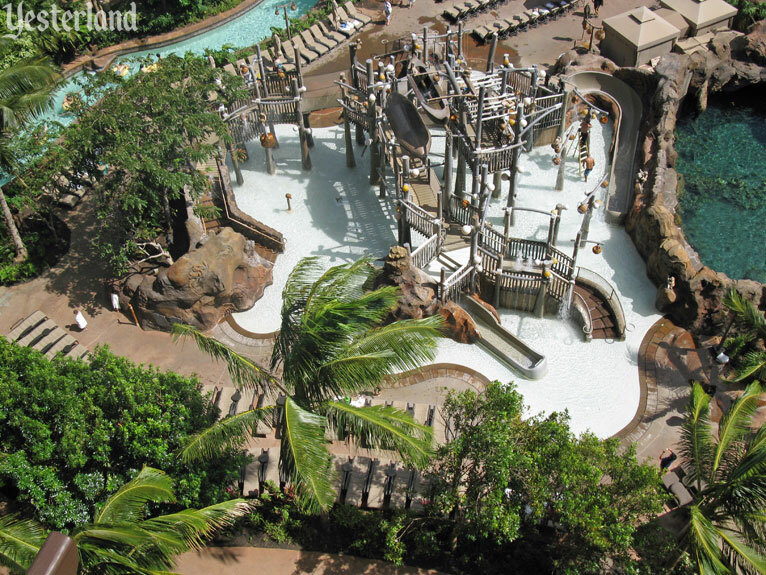 In short, Aulani guests will gain more choices, more capacity, and more on-site fun. Somebody needs to go to Aulani when the project is almost complete, take pictures, write about it, and post an article online.